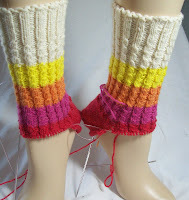 My Italian Ices socks where heel-less and I was talking about flaps, and turns and gussets. Progress will be a bit slow today, too. I haven't yet divided the brown yarn into 2 skeins—so at some point, I have to stop knitting and prepare skeins. 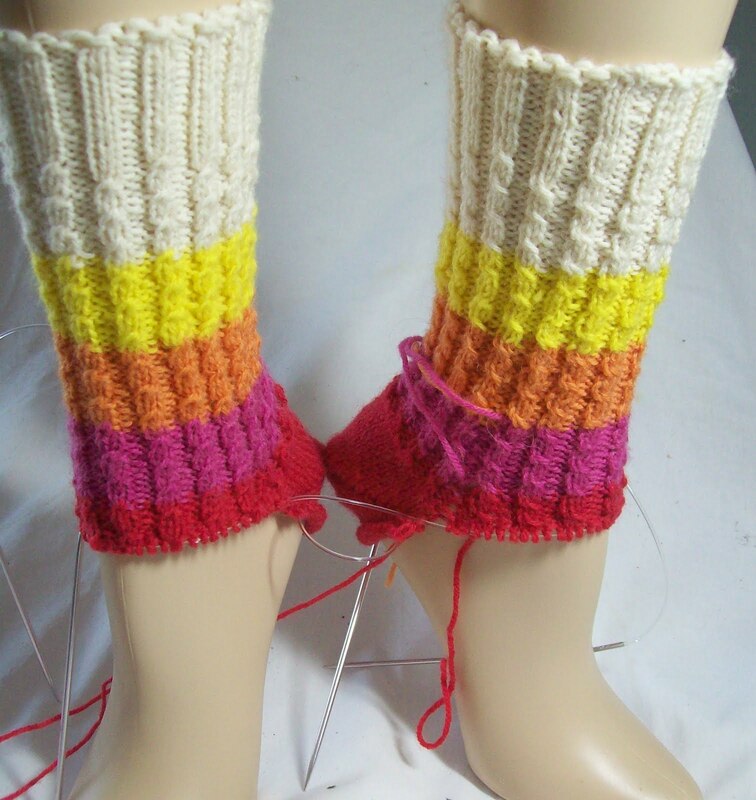 But-I'm past the heel—and once that happens, well its seems the rest of the sock zips along. Besides, once I start the brown, no more color changes, and soon after the brown, no more twists, just plain ribbing, on top, and stocking knit below—that will make things go faster, too! But for now—there is not much progress to show—that's because it was a beautiful week end—hot (near 90°/over 40°) and sunny—and hours were spent at the pool. Most of the time in the water, some of the time under the umbrella, but instead of knitting, there were games of scrabble, and bananagrams, and dominoes. There was music--a joint effort—I brought the player, and helped get the extension cord (more effort than is sounds like—it involved 2 flights of steps), Debbie brought the actually CD's. My CD collection has some party music, but much more folk music, classical, and 50's and 60's music. I have a very small (4? 5?) collection of more contemporary music—and what I do have is rock. Lunch at the pool was al fresco—fruit (melon, peaches, nectarines) and salads, including home made hummas and flat breads. Dessert was Haag Das ice cream mini's a treat from Jayson (who mother had joined playing games.) There was a bit of wine (red), the I skipped. Several bottles of cold water managed to disappear in the afternoon, too. There was also normal bit of whine that is so much part of the social climate of the pool. Last year was 7th grade all over again, I resolved to not get caught up in the constant little spats with the various crowds—and I haven't! I am still socializing—but I am limiting myself too. So that's my weekend—a bit of sun and fun, a bit of knitting. And bit of sad news too—my car is a bit sick—seems like the starter motor has seized—and I no longer live on a hill with the hope of jump starting it (it's stick, and it could be done) so I have to get it towed to the service station. It's a double whammy of no car, and the money!